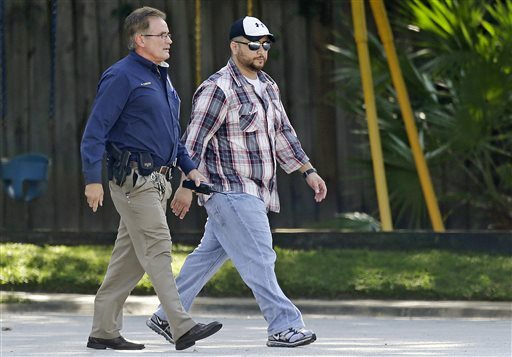 George Zimmerman was arrested on Monday after a domestic disturbance call and later charged with assault and battery. Zimmerman was arrested for domestic violence on his girlfriend, reported Bob Kealing of WESH-TV, citing two law enforcement sources. Zimmerman allegedly broke a table and pointed a shotgun at the girlfriend, police said. The door to the home in Apopka, Florida was barricaded with furniture when they arrived. Zimmerman is being held without bail at the John E. Polk Correctional Facility; if/when he is released, the Seminole County Sheriff’s Office said it will ask for electronic monitoring. The office is seeking a search warrant to locate the shotgun that Zimmerman allegedly pointed at his girlfriend, who has been tentatively identified as Samantha Scheibe. Mark O’Mara, who represented Zimmerman during his lengthy trial, will not represent him in this matter. O’Mara said previously that he wouldn’t represent Zimmerman in any future matters. Deputy Dennis Lemma said that Zimmerman was compliant when deputies came to the house. “The easiest way to describe it is rather passive. He’s had the opportunity to encounter this before,” he said. “Just when you thought you heard the last of George Zimmerman,” said neighbor Catherine Cantrell. She said she had twice seen a man who looked like Zimmerman get out of a truck that’s been in the driveway for nearly a month. The truck parked there Monday appeared to be the same one that reporters have seen Zimmerman drive previously. Zimmerman became well-known after shooting an unarmed black youth, Trayvon Martin, in a Florida neighborhood in early 2012. Zimmerman said the shooting was in self-defense. He was acquitted earlier this year of manslaughter and second-degree murder charges. Zimmerman has stayed in the news since then. He’s gotten into a public fight with his wife Shellie Zimmerman, and has been pulled over three times. Shellie filed divorce papers just days before the fight in September. She didn’t press charges because she feared she would go to jail since she’s on probation, she said later, and police recently said they were unable to press charges because the video from Shellie’s smashed iPad couldn’t be recovered.